Trails Illustrated Bend/Three Sisters [ti818] - $10.95 : Trail Explorers Outpost, Keeping the Adventure Alive! 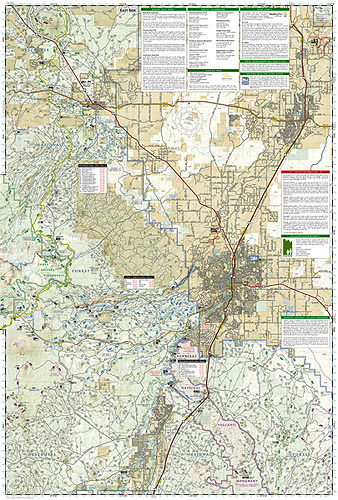 National Geographic’s Trails Illustrated map of Bend and Three Sisters is designed to meet the needs of outdoor enthusiasts seeking to explore the mountains and wildernesses in this part of central Oregon. With three of Oregon's highest peaks and one of the largest wilderness areas, the area not only has a great diversity of vegetation but also of adventure and recreation activities, which are featured on the map, for example: approximately 260 miles of trails, campgrounds, campsites, cabins, resorts and yurts, boating ramps, swimming and windsurfing areas, waterfalls, hot springs, skiing areas and rock climbing areas. Created in partnership with local land management agencies, the map base has contour lines and elevations of peaks and waterways. The trails of the area are all highlighted with mileage markers and colored according to their designated usage. Among the well known trails displayed are the Pacific Crest Trail, that traverses the Three Sisters Wilderness for about 40 miles, the Metolius-Windigo trail and the French Pete Trail. The McKenzie Pass – Santiam Pass and Cascade Lakes Byways are also highlighted for those who wish to explore the area by car. Also included on the maps are safety tips and seasonal hazards to help ensure the safety of everyone exploring the area. 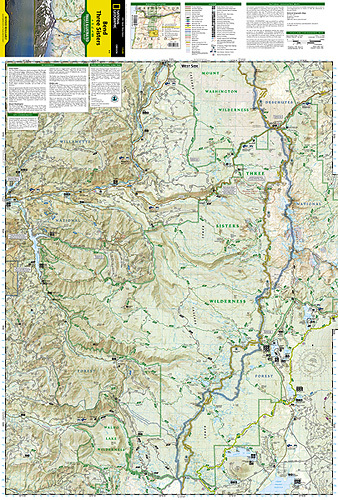 The map includes the following areas of interest: Newberry National Volcanic Monument, Willamette and Deschutes National Forest, Mount Washington, Waldo Lake and Three Sisters Wilderness and more.